It was the most surreal (and frightening) experience of my life. There I was, sitting on the weight room floor. Hyperventilating. Watching the floor swing from side to side. Lights suddenly blindingly bright. Scared. It all began the previous afternoon. Feeling like my social anxiety had gotten out of hand, I showed up for my appointment at the campus clinic looking for help. I rattled off my symptoms to the doctor — the sweats, tremors, racing heart, negative thoughts, all occurring in social encounters. I had diagnosed myself with Social Anxiety Disorder. My doctor agreed. He pulled a pad out of his pocket and wrote a prescription for Prozac. For some reason, Prozac sounded a little extreme. I had done my research on its side effects and it was the last thing I thought the doc would recommend. I just wanted something to calm me down in social settings and to push me out of what had been a fairly prolonged episode of depression. In fact, one of my favorite football players openly used another drug, Paxil, for his social anxiety. It seemed to be working for him. That’s what I wanted. But the doctor insisted. Prozac it was. The next morning, I swallowed my first dose of Prozac, headed to the gym to train my personal training clients, and waited. I was waiting for the Prozac to kick in. Waiting for the happiness and mental repose to take over. Waiting and waiting. The swaying floor. The loss of balance. The bright lights. The potential embarrassment of being found in the midst of a “Prozac-induced” panic attack. I mean, what would people think? Fortunately, Beth happened to be a psychologist. She knew exactly what to do and say. Several minutes later, when I thought it was over and went outside for air, it happened again. Then again. Finally, I found myself back at the campus clinic breathing into a strange tube before getting what I had initially came for the previous afternoon, a prescription for Paxil. I took Paxil for the next year or so, electing to deal with the side effects in exchange for a sense of social calm and “happiness”. Of course, all of this was before I learned about natural approaches for anxiety and depression — things like amino acids, functional medicine, and root causes. I still deal with social anxiety here and there. But I prefer to call it introversion. I can party, but only to a point. I like to speak in front of big audiences, but being bum-rushed by my followers and supporters makes me want to break into a sprint. I deal. I’m not the only one. According to webMD, 19.2 million Americans have social anxiety disorder. And half the population is introverted. But do we need medications and all of their side effects to overcome social anxiety? Is there nothing we can do about the awkwardness and fatigue of our introverted ways? According to Depression Sessions presenter Trudy Scott, there is a little-known (and easily treated) condition with symptoms that look EXACTLY like social anxiety and introversion. 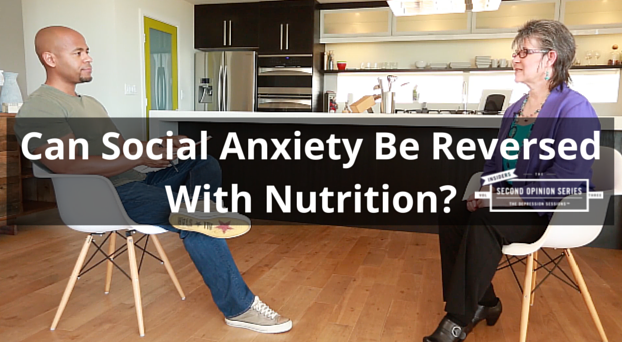 In fact, Trudy was able to eliminate her own social anxiety with a simple nutrient-specific protocol. In today’s Depression Sessions Insiders sneak peek, Trudy and I discuss this very condition and the protocol that has been shown to reverse it. Without the side effects of prescription drugs. Without the possibility of a drug-induced panic attack. Trudy’s full-length session (video, audio, and transcript) is available now as part of the Depression Sessions Insiders program. Insiders enrollment is open now through next Monday at midnight. You’ll get not only the early versions of the videos, audio files, and transcripts for a special Insiders price, but you’ll also get the final Depression Sessions Digital Access Pass (including bonuses and other goodies) long before our event launches June 14th. Don’t forget, you’ll get FREE 48-hour access to each video in June. Insiders is for those who want to get started now and take advantage of the savings on the Digital Access Pass. Enjoy today’s video. I’ll leave it posted until Thursday morning. That’s when I’ll post a new one, with Dr. Jill Carnahan on “Mind-Altering Microbes”. See you tomorrow. I just finished recording a CLASSIC podcast episode with Gretchen Rubin, author of Better than Before. Stay tuned! This entry was posted on Tuesday, April 7th, 2015 at 2:42 pm and is filed under mind, wellness. You can follow any responses to this entry through the RSS 2.0 feed.